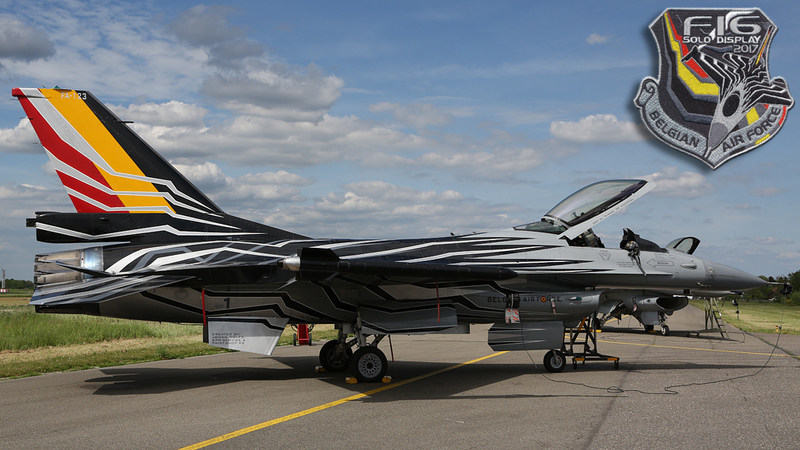 For a couple of years it has been the tradition to present to the press the ambassadors who will carry out the know-how of the Belgian Air Force and wear the Belgian coulours with pride throughout the airshow season. The presentation of the demo-teams was held at Beauvechain airbase on Tuesday, May 16, 2017. During the press-conference, Colonel Jo Heylens, emphasized on the importance of all this at various levels. 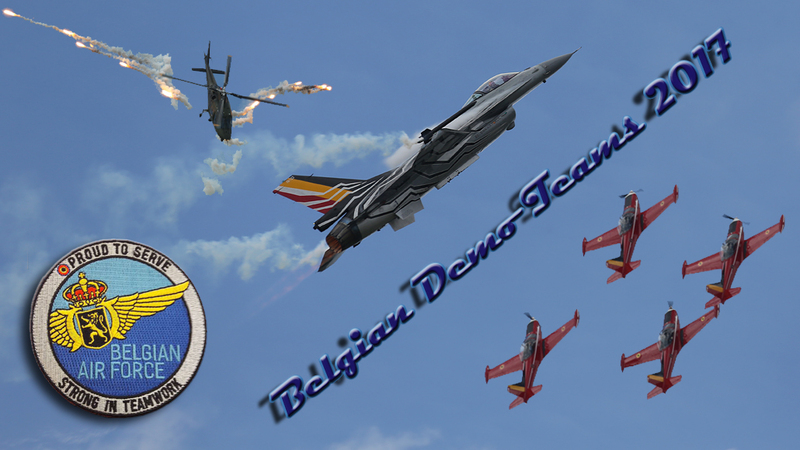 The main goal is to show, in Belgium as well as abroad, the capabilities of our pilots and personnel involved with the teams, bearing in mind that with the shows abroad, there will be a reciprocal spirit allowing to have foreign demonstration teams within our own national shows. But our demo-teams also have the mission to enhance the affection between the army and the population and the public image they are representing. This is why the work of these teams is not only confined to airshows but they are also present during big events within the sporting world, among other things, such as the bicycle race "De Ronde van Vlaanderen" and recently on May 08th, opening the 6 hours of Spa-Francorchamps. The importance of these demonstration teams has equally a much more professional intention in it, in approaching the younger generations and by doing so, generate a calling into a military career in general and within the Air Force in particular. We must not forget that the youngsters of today are the ambassadors of tomorrow. After the speech of Colonel Jo Heylens, each team was introduced individually to the press. First of all, "Gizmo", in his third and last year, presenting the spearhead of our Air Force, the F-16AM. 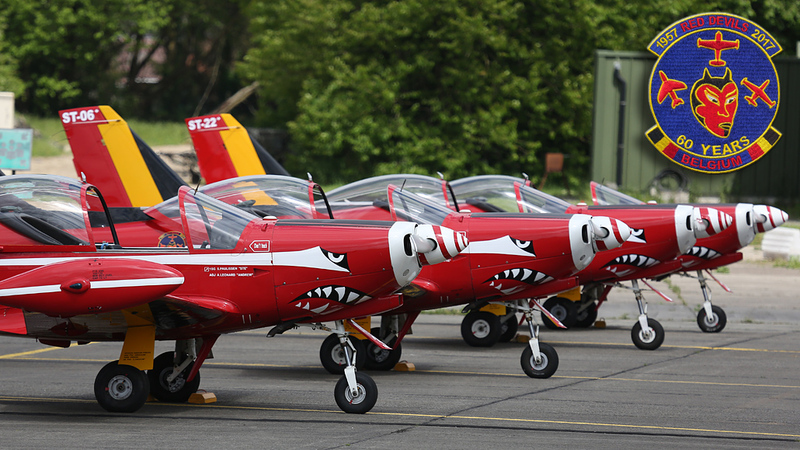 Followed by the Agusta A109 team, "Stijn" and "Kevin" who offers each time a show of handiness and finally the "Red Devils", ballet masters with four red flamboyant Siai-Marchetti SF.260. This year, the "Red Devils" team includes in their ranks a charming godmother as well as a renowned one, the race-pilot Vanina Ickx, daughter of the famed driver Jacky Ickx and the team wanted to present their godmother to the press. Noteworthy as well during this presentation day, was the presence of Laurent Bladt, grandson of Robert "Bobby" Bladt, who, 60 years ago, was the creator and instigator of the "Diables Rouges" (Red Devils) flying the British Hawker Hunter. In celebration, the team's mounts wear a special logo. After the press-conference, the press-members were invited to attend the three flying demonstrations, starting with "Gizmo" and his F-16AM "Blizzard" offering a powerful and skilled display with the much appreciated pyrotechnical effects. Next we had the Agusta A109BA flown with master's hand, showing the capabilities of this helicopter, which, after all, has 25 years on the counter this year. 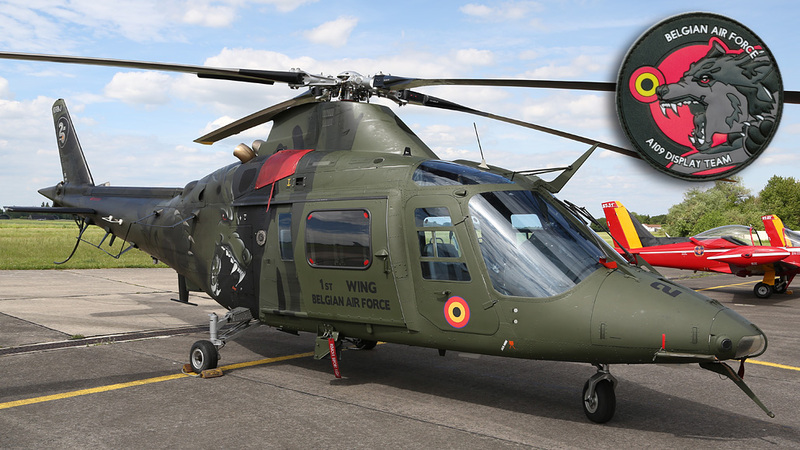 Thanks to the mastery of "Stijn" and "Kevin", this little Italian helicopter did not lose any of its superbness after a quarter of a century. The "Red Devils" were on to present their aerial ballet, lasting about twenty minutes, with impeccable formation fly-by's, beautiful bursts, daring crossings and a "solo" who did not hesitate to put the SF.260M through his aerobatic paces. In short, a superb presentation, flown with mastery by "Paolo", "Tcholle", "Jean" and "Papy". Okay, these are not jets, but what a beauty to watch in those blue skies interspersed with "white waddings". After the flight displays, the press had the opportunity to take souvenir pictures of the teams, have various interviews and, in fine, have an friendship drink with the ambassadors, allowing highly interesting conversations to be continued or to offer some gifts coming directly from the "spiritual father" of the "Red Devils". SBAP wishes to thank heartily General-Major Frederik Vansina, Colonel Frédéric Givron and the authorities of Beauvechain airbase, Colonel Jo heylens and the whole ComOpsAir IPR team as well as our ambassadors, for the Organisation and invitation of this presentation, but most of all, for their help and kindness allowing us to achieve this report. Hereby you have a pictorial summary of this presentation day. 2017 is well on its way! Do not hesitate to go and see them perform and applaud wherever and whenever you can... they all surely do appreciate and deserve this! (Serge Van Heertum ©) "Kevin" and "Stijn"
The Red Devils: "Papy", "Jean" and "Paolo"
Salute from the technician when stating the taxi. The ST22 is flown by "Paolo"
(Alain Debras ©) The ST06 is the one of "Tcholle"
(Alain Debras ©) Very close!